Jason T. Wasserman is a Member in the law firm of Silverman Thompson Slutkin & White, a Baltimore-Washington boutique litigation firm. Prior to pursuing his legal career, Mr. Wasserman worked as a Project Manager and Consultant for Ernst & Young and Accenture, where he implemented Information Technology/business process solutions for a client base of Fortune 500 companies. Prior to joining STSW, Mr. Wasserman gained extensive experience litigating product liability, toxic tort, insurance, and personal injury matters. 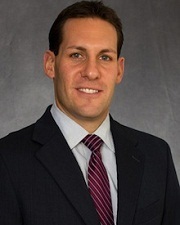 Since joining STSW, Mr. Wasserman has devoted his professional practice to complex civil litigation matters, primarily representing injured parties in personal injury, medical malpractice, catastrophic injury, wrongful death, burn injury, product liability, premises liability, and major automobile and trucking collision cases. Mr. Wasserman has an extensive track record of obtaining large verdicts and maximizing lucrative settlements for his clients. He has been recognized as one of Maryland’s “Rising Stars” by the national “Super Lawyers” publication for four consecutive years from 2010-2013. “Super Lawyers” defines “Rising Stars” as the best attorneys who are age 40 and under in Maryland, and represents only 2.5% of the eligible practicing lawyers in the state. The selection process involves peer review as thousands of ballots are mailed out to Maryland lawyers who have been in practice for five years or more and they are asked to nominate the best attorneys they have observed in action. The factors considered in evaluating lawyers for this prestigious honor include settlements and verdicts, honors and awards and legal writings.